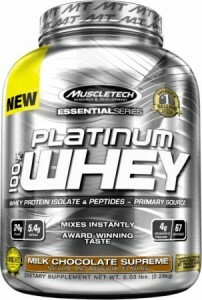 MuscleTech Platinum 100% Whey 5 Lbs. Our formula provides a massive 4 g dose of glutamine and glutamine precursor in each scoop - far more than you'll find in inferior protein sources. What's more, each scoop provides your body with 5.2 g of BCAAs - that's more than you'll find in most BCAA products, let alone a protein powder! If that's not enough, each scoop of Platinum 100% Casein provides over 10,000mg of essential amino acids - try getting that from one of those "other" protein powders. Alpha-lactalbumin - This fraction is a significant source of essential and branched chain amino acids, particularly the essential amino acid tryptophan. 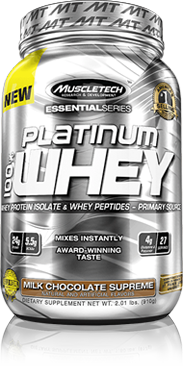 Optimum Gold Standard 100% Whey 5 Lbs.